Deep Purple played Wembley Arena and the Birmingham N.E.C. 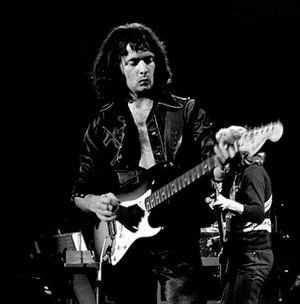 on their House of Blue Light Tour – and this was my first chance to see Ritchie Blackmore. After just the one UK show in ’85, Deep Purple‘s 1987 tour to support their second comeback album “The House of Blue Light“, attracted a huge clamour for tickets. Had the internet been invented, Ticketmaster‘s website would have crashed constantly from the weight of demand. Just like it always seems to now. Three of us bought tickets for gigs at both Wembley Arena and Birmingham NEC. Wembley was first. Mainly notable for being one of the rare occasions when temperamental guitarist Ritchie Blackmore played Smoke On The Water at a venue he famously hated (something about the lack of atmosphere) we had seats so high up we needed oxygen and a pick axe. Blackmore was partially hidden for a good proportion of the gig by a large bank of speakers. We were philosophical about this – we could see all the others and after all there was the NEC to come. So when we took our seats at the NEC and found that we had a similar view, I decided to take matters into my own hands. I don’t know if you have ever tried to sneak down the front at a gig. It is possibly a rite of passage nowadays. It looks more difficult now. When I went to see the Arctic Monkeys at the 02 last year, I didn’t see anyone get through to the standing area, although several tried. Back then, there wasn’t just one, but three barriers to get through. No bouncers, but there were ticket inspectors at each gate. And there was no general standing area to lose yourself in – it was all seated. After support band Bad Company had finished, I saw a crowd of people milling in front of the stage instead of in their seats. This was key. Not much point in getting to the front, only then sitting in someone else’s seat and being ejected when they turn up. My tactic was simple. Pretend to be with other parties who did have the right tickets and who did have their tickets inspected, and then hope I would be waved through without having mine read. The biggest risk was following the wrong crowd, who had seats at the back and then getting isolated and discovered. The first barrier was the easiest. By some miracle, I found one without a ticket inspector. A no- brainer. I tried my tactic on the second. I walked close to a large party and waved my ticket nonchalantly, and tried to gesture that I was with them, but without bringing attention to myself, a tricky balancing act. It seemed to work. I was through. It worked, and I bombed down the front of the stage. I gestured to my friends to join me. They tried and failed. The subsequent gig was a joy. I had a fantastic view right up against the stage. The band were all up for it and even the sometimes moody Blackmore played with a smile on his face all night, reaching across the monitors to shake hands with the crowd in between and sometimes during songs whilst he wrestled laser gun licks out of the whammy bar of his Fender Stratocaster and throwing it high in the air. Cool, never could have gotten away with that at the Spectrum in Philadelphia. There were only certain areas where you could go through and the ticket inspectors checked everyone. Sounds like a good concert though. I haven’t washed my hand since….